Creative Slow-Cooker Meals by Cheryl Moeller takes a little different approach than other slow-cooker cookbooks I've used. The meal plans are designed for use with two slow-cookers. I was initially leary of having to use two cookers, but quickly realized that using two was not really necessary. Each meal plan is actually two recipes and it is perfectly acceptable to just make one of the recipes. One of my favorite things about this particular slow-cooker book is that the majority of the recipes are on the simple side. There are some complex recipes that require technique, but for someone with basic, not professional, cooking skills (like me), these recipes are perfect. Despite the simple recipes, the meals I tried tasted great. The first meal I made was the Salsa Chicken on page 44. The flavor was delicious, though it did have quite a bite. I've already picked out more recipes to try once I make a trip to the grocery store. The basic slow-cooker cooking tips. Chapters of recipes for specialized diets: Vegetarian, Vegan, Dairy-free, Gluten-free. The only complaint I had was really very minor and it was that some of the recipes seem better suited to the oven than the crock-pot. For example: Little Piggies in a Blanket. Why would I cook it in the slow-cooker for 1.5 to 2 hours when I can make it much more quickly in the oven? One of the main reasons I use slow-cookers is because the recipes generally require longer (minimum of four hours) and can cook while I'm away at work. 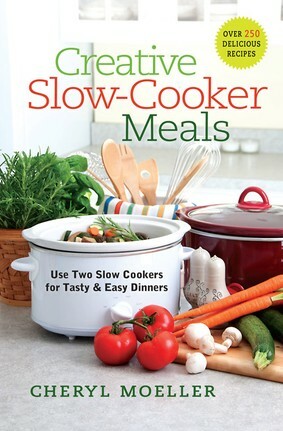 Again, that is a very minor complaint and I definitely recommend Creative Slow-Cooker Meals by Cheryl Moeller as a great resource for anyone who loves to use the slow-cooker. Click here to visit the First Wild Card Tour for Creative Slow-Cooker Meals by Cheryl Moeller and view a chapter of the book. Disclosure of Material Connection: I received this book free from the publisher as part of FIRST Wild Card Tours. I was not required to write a positive review. The opinions I have expressed are my own. I am disclosing this in accordance with the Federal Trade Commission’s 16 CFR, Part 255: "Guides Concerning the Use of Endorsements and Testimonials in Advertising."